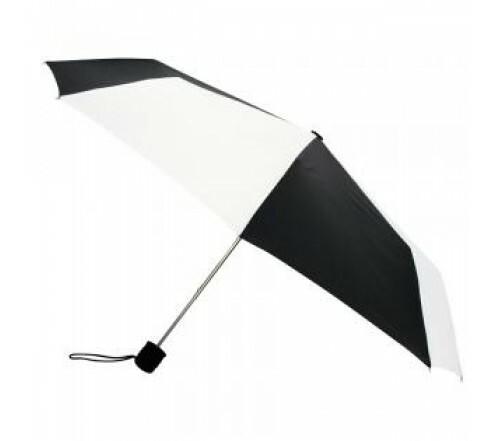 Custom black & white 43” manual open mini fold umbrellas are head turners in crowd due to their realistic contrast. As, black and white are our basic colors and everyone identifies them easily. This combination has been utilized in various brand theme colors and people never seem to really grow out it. Promotional black & white 43” manual open mini fold umbrellas can be employed by all marketers who wish to remain in the public memory for such a unique gift. Personalized black & white 43” manual open mini fold umbrellas will be retained in most homes because people find them appealing, interesting and very elegance. Features – nylon fabric, steel windproof frame, rubberized handle and manual open function. Dimensions - 43" arc - Closes to 10". Imprint area - 7"W x 6"H.